A corsage is an arrangement or bouquet of flowers commonly used as a pin or on the wrist for special occasions such as prom. It is meant to be an accessory that complements your dress and allows you to express your sense of style and fashion. Most people when thinking of a corsage think of the arrangements worn by their mothers and even grandmothers, but this is not so. There are a variety of styles and designs that allow you to create or buy the corsage that is just right for you. Traditionally corsages were made with carnations. This flower remains a popular choice because of the wide variety of colors available. It is a rich, ruffled flower whose name roughly translates to “flower of love.” Depending on the color, each carnation is said to have a different meaning. Yellow, for example, represents disappointment, dark red represents deep affection and love, while white carnations are associated with purity. Roses are another popular flower for corsages representing love and passion. 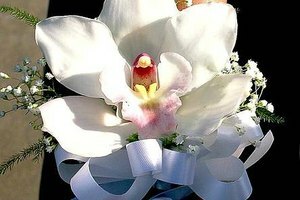 Other popular flower options include alstroemerias, freesias and orchids. While these are the common choices, any type of flower can be used. The flowers are arranged and adorned with lace, pearls, beads or the embellishment of your choice. There are a few options for wrist corsages. Ribbon corsages have the flower arrangement attached to a ribbon. The disadvantage of ribbon corsages is that they untie and fall off easily, especially when dancing and moving around. 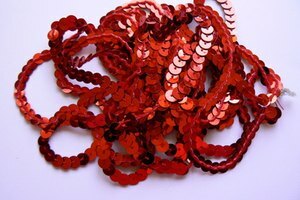 Elastic corsages, where the flowers and adornments are attached to an elastic band, are reasonably priced. Due to the elastic, these corsages do not fall off the wrist as easily as a ribbon corsage. The most expensive of all corsages is the bracelet corsage. These corsages are made using a bracelet and have a flower arrangement adhered to the bracelet. It is harder to find a large variety of options when shopping for a bracelet corsage, but you can always make one yourself. The pin-on-corsage is the same type of flower arrangement as a wrist corsage, but instead of having the flowers attached to a ribbon, elastic band or bracelet, the arrangement is attached to a pin. The pin is usually worn on the left side of the chest area. This type of corsage is less popular with women, as it may interfere with the design or style of their dress and can also weigh down a strapless dress, causing it to hang too low. This type of corsage is more popular with men. Also known as a boutonniere, men usually wear a single flower on their left lapel. Many times the man accompanying the woman is the one to buy the corsage. Although this is custom, some women decide to accompany their date to pick their own corsage. When shopping for a corsage, be sure to choose flowers in a color that coordinates with the dress you will be wearing. The corsage should not be in a contrasting color, nor should it be so big or loud that it detracts attention from the dress and the overall look you want to achieve. Take your dress or a swatch of your dress to match the color; this will help you coordinate your corsage perfectly. Victoria Zeisberg is a licensed insurance broker with over 10 years experience in the insurance and financial industries. Drawing on her professional background, Zeisberg began writing in 2007. Her work has appeared on various websites covering finance and other topics. What Is the Meaning of a Garter for Prom?